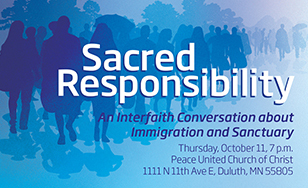 The College will bring together speakers from different religious backgrounds for "Sacred Responsibility: An Interfaith Conversation About Immigration and Sanctuary," a free public discussion at 7 p.m. Thursday, Oct. 11 at the Peace United Church of Christ, 1111 N. 11th Ave. E. in Duluth. Child care will be provided and refreshments will be served. "Sacred Responsibility: An Interfaith Conversation about Immigration and Sanctuary," will examine the spiritual and religious aspects of immigration around the world. Speakers from different walks of life and different faith traditions will engage the public on what role migration plays in sacred narratives. The discussion will focus on topics including: How is a stranger to be treated, according to spiritual authorities? Is the image of sanctuary common across faith traditions, and what are its limits? What are the responsibilities to one's community in comparison to others? "Our aim in this conversation is to delve into religious and spiritual teachings about those who are migrating, across a variety of traditions," said event organizer Elyse Carter-Vosen, associate professor of Global Cultural and Language Studies. "Rather than starting with political and often racialized arguments around immigration, we will enter the conversation by exploring what the Jewish, Muslim, Catholic, Protestant, and Anishinaabe traditions teach about topics such as how worth is judged in these spiritual frameworks, how someone becomes a part of a new community, and where the balance lies between religious values and obeying the law of the land." Carter-Vosen said the informal panel discussion will encourage reflection and participation among audience members. "We hope those who attend will come away with a deeper understanding of some spiritual teachings about immigration from traditions other than their own, and with questions they wish to explore further," she said. Rabbi David Steinberg, Temple Israel (Duluth). This event is presented by the Oreck-Alpern Interreligious Forum, a 12-year partnership between St. Scholastica and the community. The Interreligious Forum promotes respect, understanding, and peace among the diverse spiritual communities of our region through sustained cross-cultural dialogue and collaborative projects and events. This event is co-sponsored by CHUM, by St. Scholastica's Office of Diversity and Inclusion and Department of Global, Cultural and Language Studies, and the Department of Equity, Diversity, and Inclusion at the University of Wisconsin-Superior.